Hand-built artificial and preserved palm trees manufactured in the UK using the very latest methods and techniques. From delicate tabletop specimens to soaring Majesty palm trees, all our palms are renowned for their realistic appearance. Quite simply, ours is the finest range of styles and sizes in artificial & preserved palm trees available in the marketplace today. Foliages can supply virtually any size or quantity based on your specific requirements. Our artificial and preserved palms are installed in some of the most prestigious locations throughout the world. 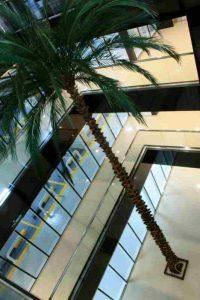 CUSTOM MADE PALM TREES The picture shows one of our artificial palm trees completed in Al Barsha, Dubai for Arenco Group. The preserved palm foliage is preserved to the highest standards, and is fully fire retardant. Single, double and triple stems and trunks can all be specified in our preserved palms, as can curved stems. All preserved palm trees can be built on base-plates, or concreted into planters, to meet your specifications. Both artificial palm trees and preserved palm trees are available with FireSilx™ inherently fire retardant, or UVSilx™ (ultraviolet light resistant) colour-fast foliage, for interior or exterior use. From delicate table top replica palms to large specimen artificial palm trees for landscaping or theme parks in FIREsilx™ inherently fire retardant or UVSilx™ colour-fast foliage for interiors or exteriors – a huge range is available for purchase immediately. Our Preserved Palm Trees and Artificial Palm Trees are of the highest quality and represent fantastic value with the added touch of reality. These trees will enhance any project using preserved or artificial palm trees that you are working on and have the added bonus of being suitable for indoor use with our fire retardant foliage. We can supply you with our preserved palm trees in the shortest possible time-scale and at the best prices available. Email your enquiry to – sales@foliages.ae and a member of our preserved & artificial palm trees team will get back in touch within 24hrs.